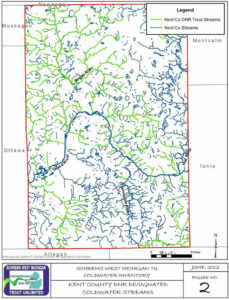 The Schrems West Michigan Chapter of Trout Unlimited’s district covers over 4,700 square miles and includes an overwhelming number of streams and rivers. Attempting to fulfill our mission over this geographic area requires an understanding of these resources beyond what is currently available. While a great deal of information exists on our streams, it has never been compiled into a single document for use by an organization such as ours. This report represents our first efforts in a comprehensive understanding of the coldwater resources in our district, and is intended to serve as a detailed reference for all of the coldwater streams in Kent County, which lies within the center of our district, is home to many or our members and board members, and includes our largest population center, the City of Grand Rapids, and its bedroom communities. 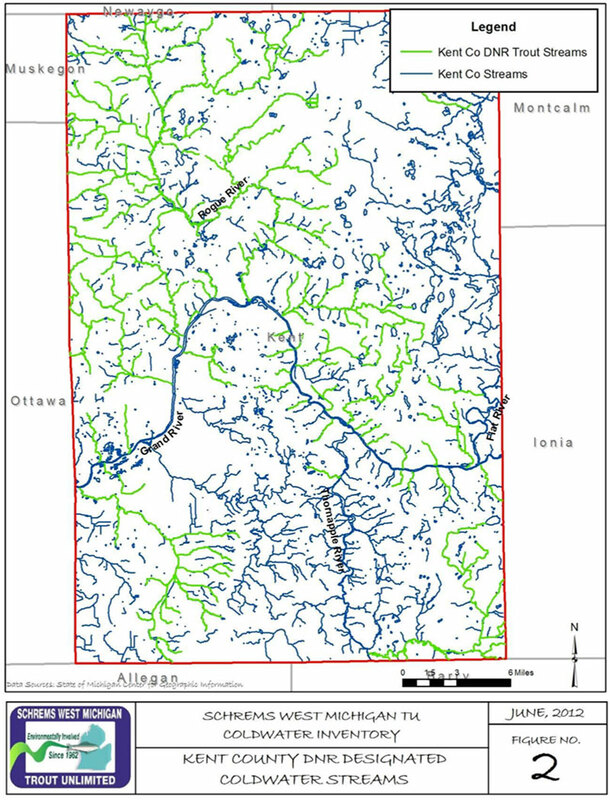 In addition to background information relative to the location, history, biology and known impairments of Kent County coldwater streams, this report includes specific recommendations for monitoring, protection and restoration. This report is intended to be a “living” document, with continuous updates and revisions as additional information becomes available. A vast amount of information has been compiled and summarized in this report. An attempt was made to present the information in a format that is not overwhelming and can lead to protection and measureable improvement of our coldwater resources. Many of the small tributary streams to our larger rivers such as the Grand and Rogue flow through private land and are not necessarily fishable, but serve critical roles as nursery streams by providing a spawning and rearing habitat, and provide seasonal refuge for temperature sensitive fish. Streams such as Shaw, Stegman and Rum Creeks flow icy cold and are lifelines to the thermally-threatened mainstem of the Rogue River. Protection of these small streams and their habitats for supporting early-life stages of coldwater fish are crucial. Medium-sized streams, especially those that are blocked from migratory salmon and steelhead, support sustainable brown trout populations with various age-classes of trout. Bear, Cedar, Tyler and Duke Creeks are prime examples and all offer some degree of public access. Instream and riparian improvement and barrier removal projects would benefit their coldwater ecosystems. A surprising number of Kent County streams harbor self-sustaining brook trout populations. While most of the populations are small and dominated by brown trout, a few places were found to exist where brook trout are the dominant species and the fish thrive in small, often overgrown and unfishable streams. Generally, these streams are inaccessible to non-native trout and salmon. These small streams are true treasures and are very susceptible to impacts. Urban streams such as Buck, Indian Mill and Mill Creeks and the lower Rogue River represent the last of our urban coldwater fisheries in Kent County. These streams offer unique recreational and educational opportunities to a large population. Based upon the data collected for this report, Indian Mill and Mill Creeks and the Rogue River appear to serve as important nursery habitats for migratory trout and salmon. Buck Creek is unique to these three streams in that it contains trout populations near areas of significant public access.